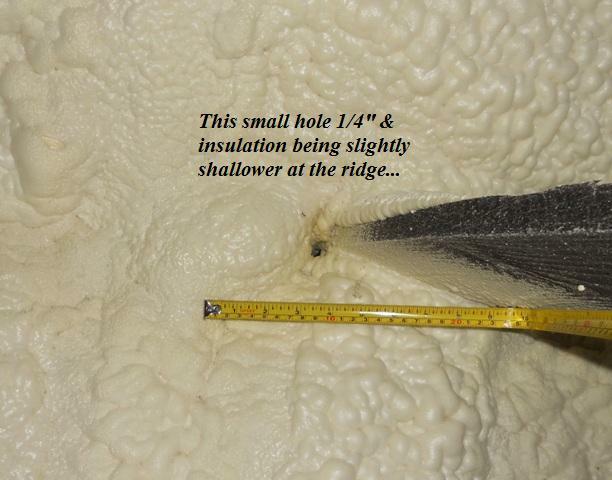 In our ongoing series on Air Sealing, we are going to pop into the attic for the next few articles. Not only is this a great time of year to work in your attic, but with all the recent snowstorms, those fun little red arrows on the diagram start to make sense – all that heating I am paying for is going through the roof. While many houses around here have an unconditioned attic, many people are hearing and asking about the benefits of pulling the attic into the conditioned space, and whether this is only for new homes, or if it can also be done in older homes. In that vein, we would like to look at one of the best options available for creating a conditioned attic using the hot-roof method. Unfortunately, the term hot-roof is a misnomer as the roof really is not that much hotter than a normal roof. Most studies show anywhere from 1° to 5° maximum increase in surface temperature during the sunniest part of the day, while at night the surface temperature drops faster than a regularly vented roof. 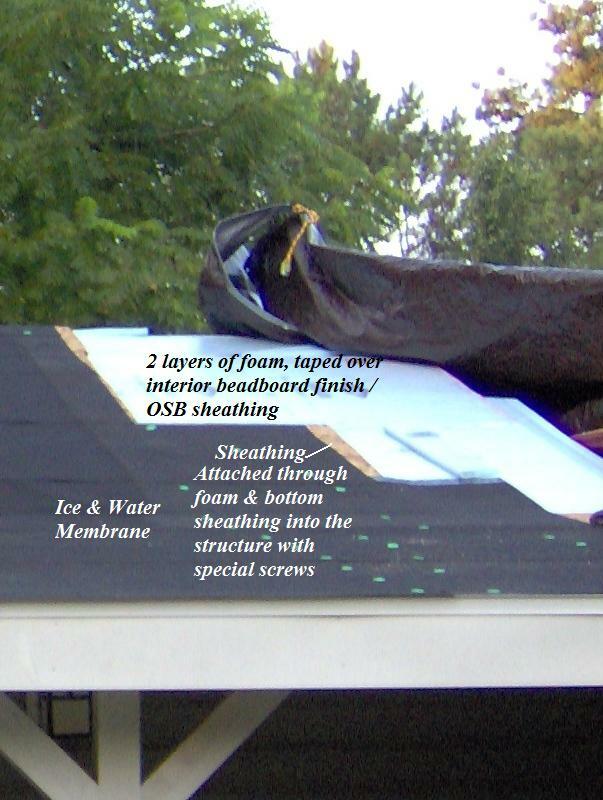 A hot-roof is one where there is no ventilation required as the insulation is directly attached to the roof sheathing. While some try to do this with Fiberglass or Cellulose, their efforts are for naught and quite simply, it is not allowed by any legitimate building code out there. Unconditioned attics require more insulation as the temperature in the attics can easily top 140° in most areas of the country during the summer. In many locations electrical, water, & air-ducts run through those areas that make finding electrical junction boxes hard, and water lines can freeze or will spring a leak due to expansion & contraction issues due to temperature changes. 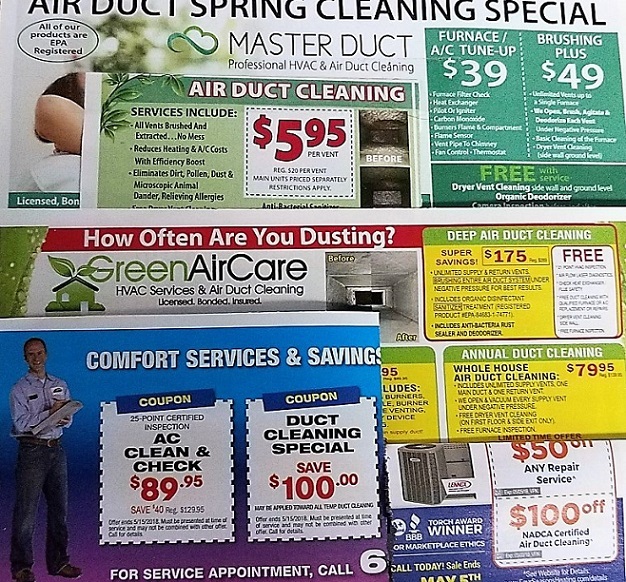 By putting the ducts inside the conditioned space, not only do you not have the issue where the air in there is superhot or cold, but also any duct leakage is not being lost outside, but kept inside the house. 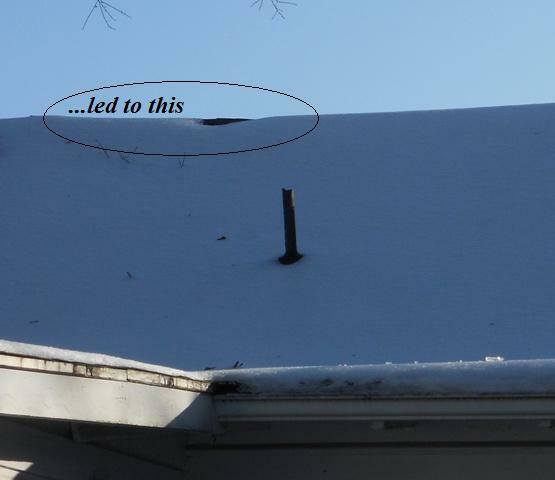 For our neighbors up north, a properly conditioned & sealed attic will eliminate ice-dams. While there are many variations, there are two popular options used to create a hot roof. 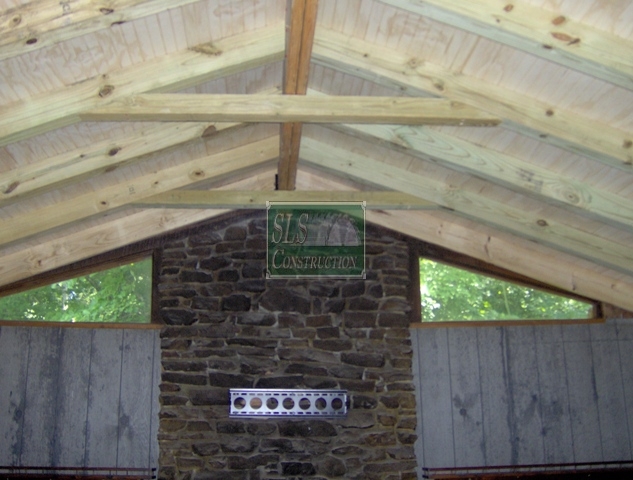 The first method revolves around foam sprayed in place (generally sprayed in between the rafters / trusses), while the second utilizes foam board (generally placed on top of the exterior roof sheathing.) Depending on your roof, ease of access, etc… this will help dictate which method would be best for your home and is generally best left to a professional (not including cheaper in the case of sprayed foam). Far & away, this is the most popular option available, in not only new construction but in retrofitting work where the attic is not finished. In cases where there the roof is, what we refer to as all cut up (multiple dormers, pitch changes, turrets, etc…) this is about the only real choice one has to get all the details right, and completed in a decent amount of time. While this option is not as popular, it does offer some benefits that one should not overlook. The biggest that applies to both new & older homes is the elimination of thermal transfer. 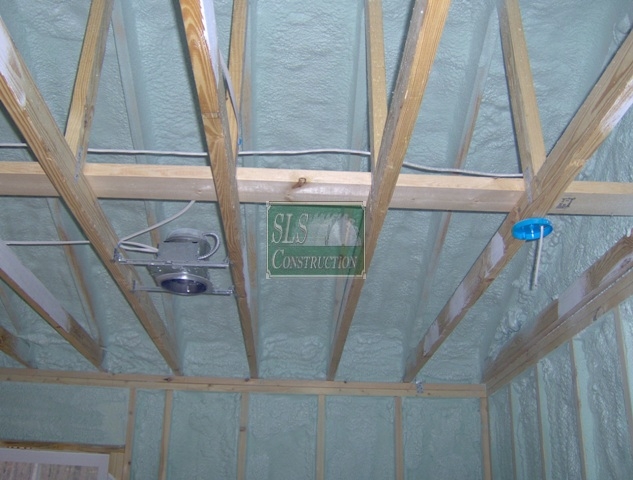 In the case of spray foam, unless the rafters or trusses are fully coated with foam, heat will transfer through the wood, to the sheathing & finally outside. While that may not be a big concern for us in the south, up north that can lead to some issues with ice dams, and increased heating loads. Another benefit for those with timber frame homes, finished attics, cathedral ceilings, or you are worried about losing any headroom is all the work is done outside. For many of you that read / looked at all the pictures in the “Snow is truly one of the best diagnostic indicators out there…” article, one can easily see what happens when the warm air from inside gets into the attic. Since this method brings the attic into the conditioned space, you no longer have the venting to help dissipate any little leaks in the buildings thermal envelope. This leads us to these great pictures from Jeffery Sauls of D2D Sustainability of Atlanta Georgia who specializes in ratings for EEMs & ENERGY STAR certifications. For more great information on this subject and these photos, you might want to check out this post by Allison Bailes of Energy Vanguard. Most of the other systems on the market are derived from one of those two methods above. In the case of a SIPS panel, the steps listed above in the foam board section apply. The nice item about them is the 6” limit does not apply as some panels are up to 12” in depth giving you a greater R-Value and are screwed into timbers. With that said, depending on the SIPS panel you buy, you could actually have either a piece of foam board glued between two pieces of OSB, or a panel created where they inject spray foam between two sheets of OSB (awesome to see that process & the rolling presses they use to keep it from expanding beyond it’s specifications). To find out what the best solution is for your home, it is best to bring in an individual that understands all the different components, how things work, and will give you straight answers and not just try to sell you on a fad, or their product. 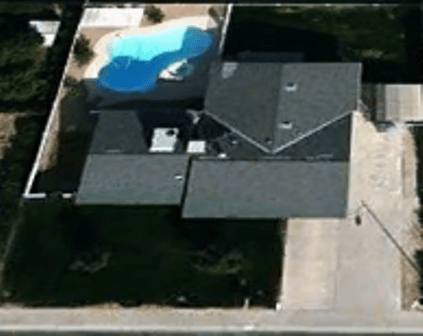 Unless you live in climate zones 2B or 3B (Desert area’s in Texas, New Mexico, Arizona & California) the codes and common sense will point you to Closed Cell Foam. If you wish to believe a certain manufacturers claims (just one of many bogus ones) and install an Open Cell product, make sure it has a vapor barrier sprayed to the foam. The same applies to foam boards especially when you consider the limits on how much you can apply. Closed Cell & XPS has almost twice the R-Value as others, if not more in some cases. As a warning note – all foam products lose some R-value over time, so before you buy into the manufactures installed R-Value number, you might want to cut about .5 off that number if they state it is above an R7. Open Cell does hold up a little better, but as of now, anything above a 3.7 is pure marketing. Do I still need to airseal around all those penetrations in the attic floor? While one has moved the attic into the conditioned area, you still need to caulk or foam those penetrations. The primary reason is not to prevent air leakage, but to help in case their is a fire and preventing it’s spread. For those utilizing open cell, this becomes even more important to help prevent the product from essentially sucking in that moisture. Do I need as much insulation? Are you ready for this – yes, no & it depends. Unfortunately, this article is a little longer than I was anticipating so we will delve more into this topic later. In short, depending on your climate zone, and local codes, you should have R30, R38 or R49 in your attic. 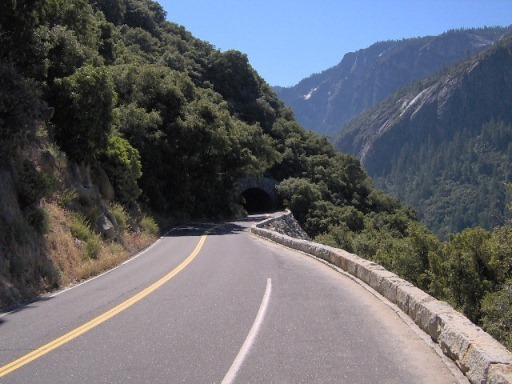 The 2009 IECC allows for two small exceptions – the U-factor alternative (402.1.3 & .4 – that require an overall R value of 28.6, 33.3, and 38.5 depending on your climate zone) & another one for area’s further up north, the “step-down” option (402.2) when the insulation extends past the top plate (if R38 is required only need R30 / R49 only needs R38). 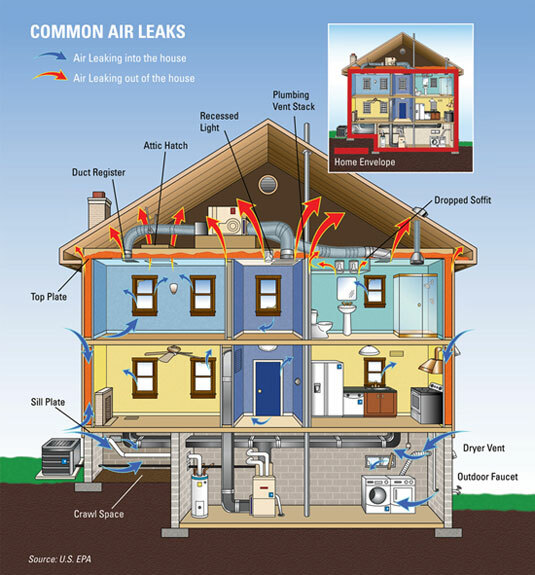 FAQ: Are all air leaks equal?